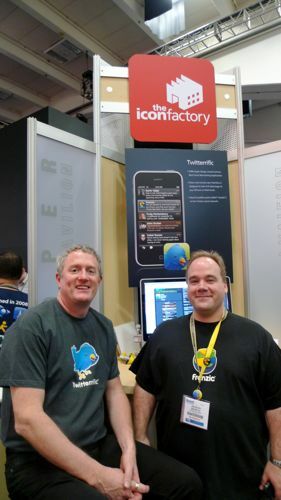 Craig Hockenberry and the Icon Factory are among the earliest and most well respected iPhone developers in the community. In addition to their amazing design work and Mac and Windows software, they created the highly popular Twitterrific and Frenzic for the iPhone. TiPb: We've been spending a lot of time lately discussing the App Store and what business model(s) it will evolve From launch, you took the route of having both a premium paid version of Twitterrific and a free, add-supported version. What made you settle on that idea, and how effective has it been for you? Craig Hockenberry: The desire to have both a free and paid version of Twitterrific came from our experience on the Mac. It's the best of both worlds for everyone: we get some funds to pay for the development of the product, and users get to choose how they want to support us. We decided on having ads before the final details of the App Store were revealed. Since there are no demos in iTunes, the ability to have a free version for people to evaluate has been a big benefit. A lot of my fellow developers are now looking at this model. With stories about apps being rejected or removed from the App Store, how (if at all) does this effect your planning or strategy as a developer? Is it something a developer should have to consider? Rejections and other App Store issues are certainly a factor in planning. But it's just one aspect of a successful product: it's more important to focus on how an app will make customers happy or solve a problem. That being said, I know of an app that was cancelled before it even left the drawing board. It included both podcasting and fart noises, and was actually a great app concept. I'm sad that it will never get made. There's still a demand for multitasking on the iPhone, which would obviously benefit apps like Twitterrific. How far will Apple's still- pending Push-Notification service go towards satisfying this demand for you as a developer and as a user? I will make the observation that Apple is still getting its own push service (MobileMe) in order, so we're all waiting to see how this will pan out. It's not a simple problem from a developer's point-of-view. Now that Twitter seems to have solved their up-time issues, what could they surface or add to their platform to make apps like Twitterrific even more useful or powerful? One thing I see a need for is the ability to "jump into" existing threads of conversation amongst a group of users. This has been hard to do until recently because replies didn't contain accurate links to original tweet. That has improved recently (thanks to Twitter implementing one of my suggestions.) But there could still be a lot done in that area to make the user experiences better. You've now developed for the iPhone during three distinct phases: pre-SDK, post-SDK under NDA, and now SDK post-NDA. Any particular insights you gained from that range of experience, and what steps would you like to see Apple take next? Everything led up to the "SDK post-NDA" phase. It's what I wanted all along: developers can now freely exchange information about what we're working on. When something doesn't work right, others can help. I think Apple is fully aware of this need: the recent launch of devforums.apple.com is an excellent example of how they're actively working to help developers come up to speed with this new platform. The only thing that I'd like to see from Apple at this point is a detailed list of what is and is not allowed in the App Store. This lack of information regarding acceptance limits innovation from developers: it's too risky. If there were absolutely no limitations on the SDK, what app would you never consider developing yourself, but still love to see on the iPhone? I'd love to see a native version of Lotus Notes with excellent calendar support. Seems like a strange request, I know. Profound thanks to Craig Hockenberry for taking the time to share his insights on the iPhone. Furbo.org is his personal blog, iconfactory.com is his company's website, and both Twitterriffic (read our review) Free and Premium and Frenzic (read our Forum review) are available via the iPhone iTunes App Store.